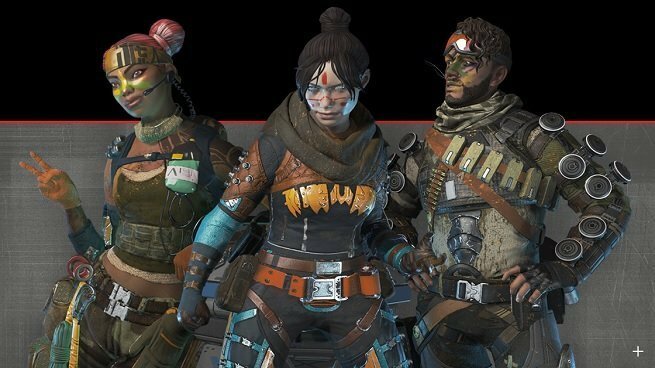 The first Apex Legends Battle Pass will also go live tomorrow. The basic Battle Pass will set you back 950 Apex Coins, which should only cost $10 USD. Every single level earned while playing this season will unlock new cosmetic rewards and currency. The Battle Pass Bundle will instantly unlock the first 25 reward tiers, and can be purchased for 2,800 Apex Coins. That’s $30 USD. Upon purchasing either Battle Pass, you’ll instantly unlock the Lifeline Revolutionary skin, the Wraith Survivor skin, and the Mirage Outlaw skin. All three can be seen in the header image at the top of this article. Respawn also revealed that all players, even those of you who do not purchase the Battle Pass, have new rewards to look forward to and unlock. All Season 1 players are eligible to earn a Wild Frontier Legend skin, five Apex Packs, and 18 Wild Frontier stat trackers. “You’ll receive all the rewards up to your Battle Pass level (which is your current level for the season) retroactively! For example, if you’re on level 20 for the season when you buy the Battle Pass, you’ll unlock all rewards for every level up to 20, plus three special Battle Pass skins.